This is chromium-nickel grade of stainless steel that may be hardened by a single low-temperature precipitation-hardening heat treatment. Excellent mechanical properties at a high strength level may be obtained by such treatment. Scaling and distortion are minimized. This material should not be used in the solution treated condition. The strength and corrosion resistance properties of 17-4 hold up well in service temperatures up to 800F. Fabrication techniques for this steel are similar to those established for the regular stainless steel grades. This material machines well, has excellent welding characteristics, and forges easily. The combination of excellent mechanical and processing properties makes this grade adaptable to a wide variety of applications. Machinability: This grade has machinability rating of 48% in the annealed condition (cuting speed of 80 feet per minute). In the overage condition the rating is 76%, with surface cutting speed of 125 feet per minute. 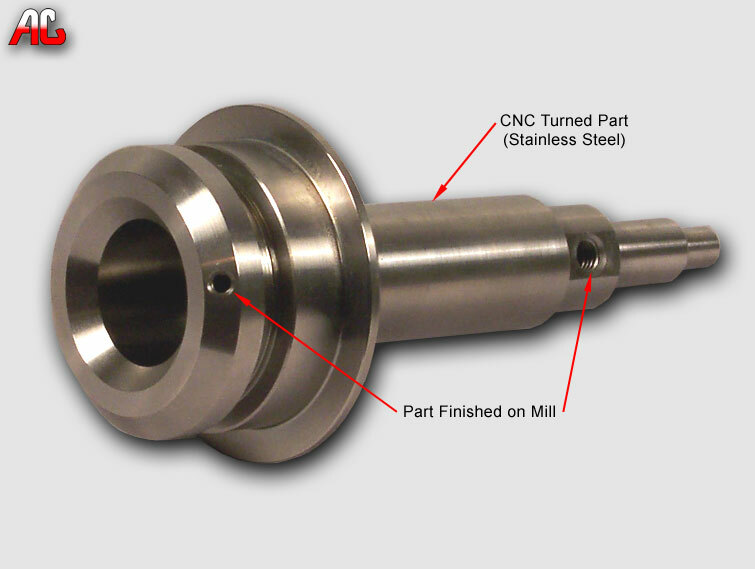 This 304 stainless steel high tolerance part was first turned on our Nakamura Tome lathe. Inside counterbore 0.500 +0.0003/ -0.000, 2.156" deep was concentric within 0.0002" to the outside of the part. Surface finish of that counterbore was held at 8 micro inches. Side holes were finished on one of our Matsuura vertical milling machines.